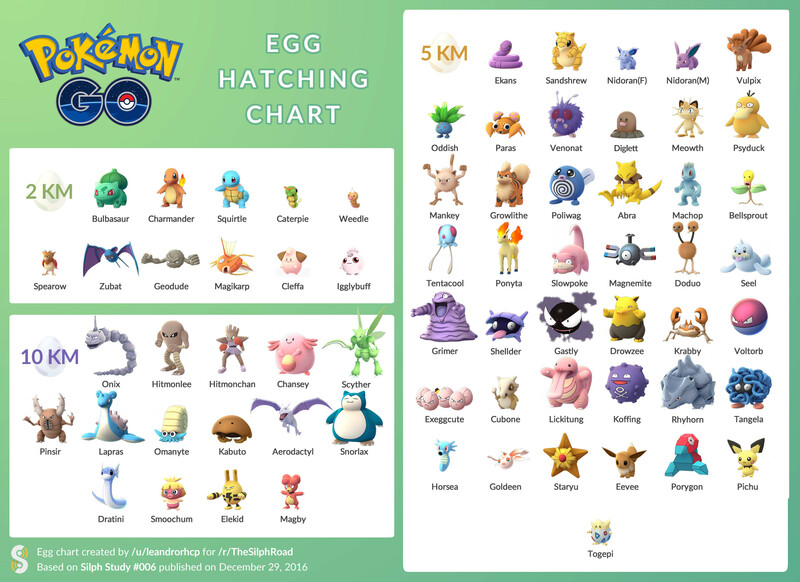 Which Pokémon can appear by hatching eggs? I have different Pokémon eggs. One takes 10km to hatch, three take 5km, and the rest take 2km. Which Pokémon can I get by hatching these eggs? You cannot get any further evolution stages of pokemon from an egg, nor can you get a legendary from an egg. 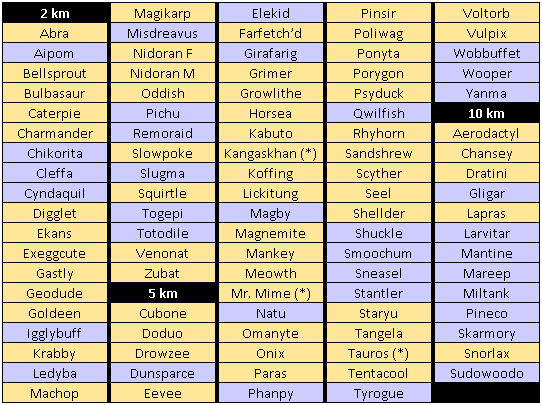 I've found an updated version of what you get for every 2k, 5k, 7k and 10k egg. I plan to keep this answer updated when the eggs change. In conjunction to the other answers, it does appear that you can get 2km Pokémon from 5 or 10km eggs and 5km Pokémon from 10 km eggs. A number of people have stated that they have gotten lower tier Pokémon from higher tier eggs. Here are a few such examples. 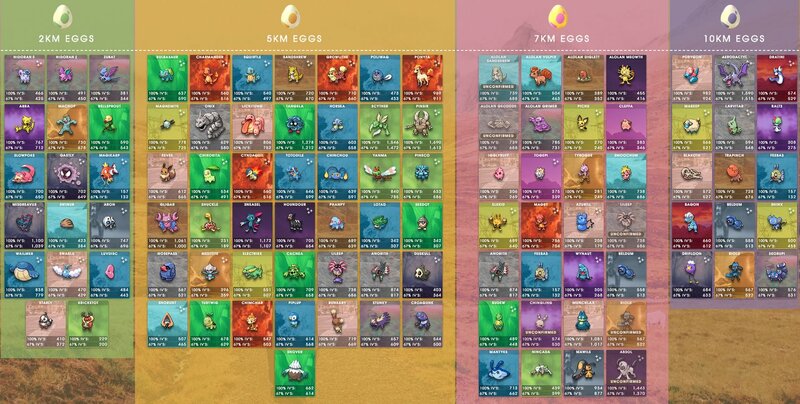 Given that so many people have reported this happening, it appears that there are tiers of Pokémon from eggs, however lower tier Pokémon can be hatched from higher tier eggs. This picture here depicts these tiers. As of the Generation II release, the egg tiers have been changed up quite a bit. A full list can be seen on this site. Some Pokemon that can hatch from 7km eggs can also hatch from a 5km or 10km egg: they are Anorith & Lileep (5km) and Beldum & Riolu (7km). From what I've seen so far, there doesn't appear to be any strict limits on which Pokemon can appear in varying distance eggs. For example, I've gotten a Weedle in both 2.0 and 10.0 kilometer eggs. However, I seem to get less common Pokemon from the longer distance eggs. 5km: Everybody else that can hatch from eggs. I am unsure about Tauros, Farfetch'd, Mr. Mime, and Kangaskan, but I'm pretty sure they hatch from 5km eggs. Some pokemon are harder to get from eggs than others, even if they hatch from the same type of egg. For example, Grimer and Ekans both hatch from 5km eggs, but Grimer is rarer(Ive hatched 2 Grimers and countless Ekanses). So don't expect 2 Cleffas and an Iglybuff from 3 2km eggs, expect 1 Weedle and 2 Zubats instead. Hope this can help. EDIT: Looking at the other answers, I should say that I have seen a Spearow hatch from 2 km eggs and 5 km eggs and seen a Porygon hatch from a 10 km egg. What Pokemon can you hatch from the gift eggs? Is it possible to hatch evolved pokemon? 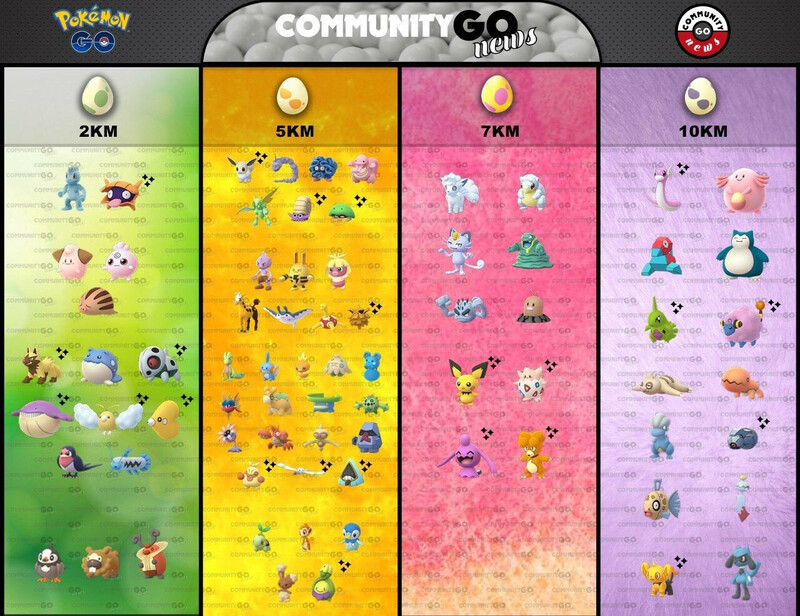 How many candies do you get for every 2k, 5k, and 10k egg? How do I get rid of eggs? Is my movement tracked for hatching eggs while the screen is locked but the app open? Which will provide more Stardust: one 10KM egg or five 2KM eggs? How do I get 10km eggs? Are Pokémon in Spanish eggs different to UK eggs? Is there an advantage to saving my Incubators for 5 and 10km eggs?